Sun Kissed Tee is ready for Winter! 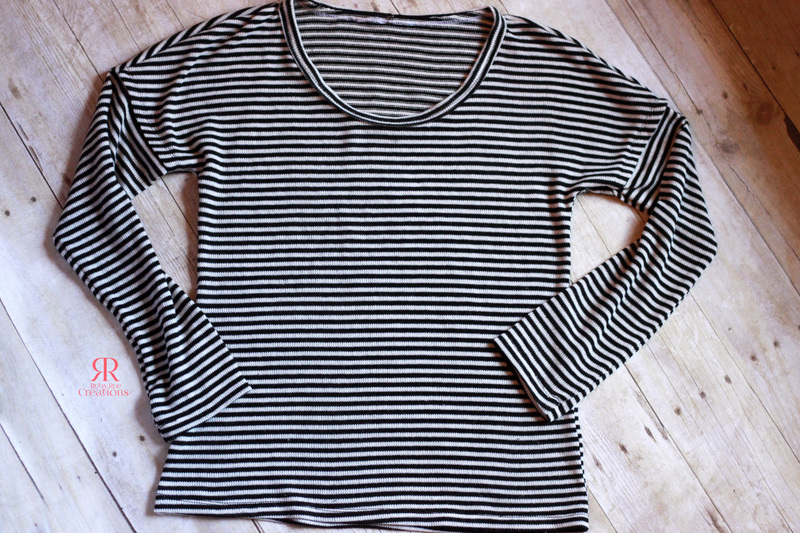 Add Long Sleeves to a Dolman Tee - Peek-a-Boo Pages - Patterns, Fabric & More! Hi everyone! I’m Kasey from Ruby Rue Creations! 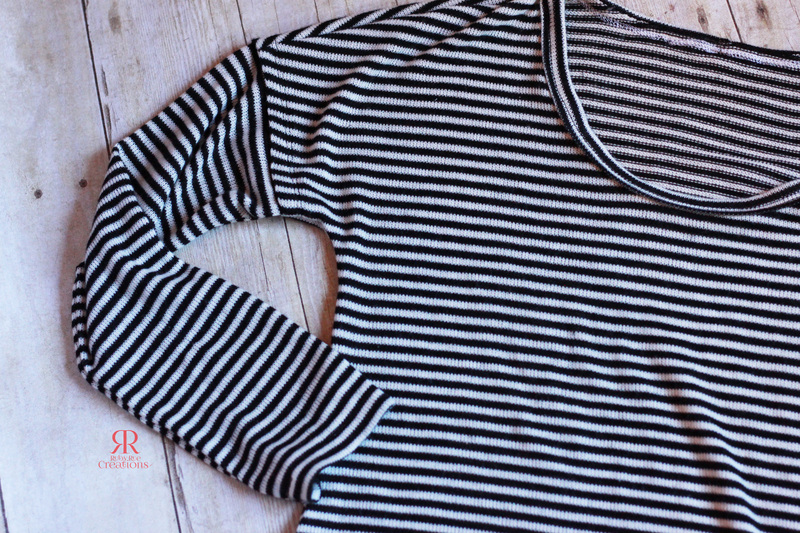 I love all things Peekaboo and today I’m going to share with you how I added long sleeves to the Sun Kissed Dolman Tee. I love getting the most out of my patterns. If there’s an easy way to modify a pattern to get a whole new look or to make it work for a different season, then I’m on it! 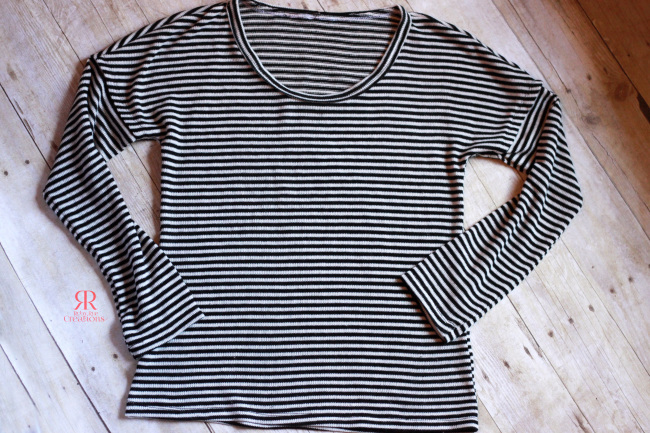 For this project I used the Sun Kissed Tee pattern, of course, and I also used the sleeves from the Santa Fe Tee. Dolman tees, by design, do not have inset sleeves. 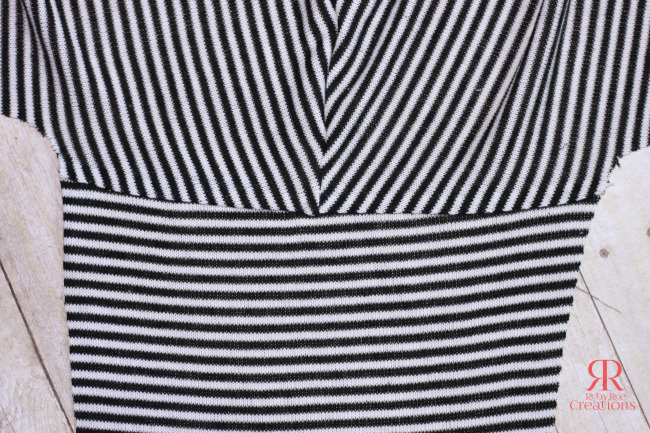 The sleeves curve as part of the main body of the garment. Some dolmans do feature long sleeves, however, this takes up so much fabric! So today I’m going to show you the easy way to transform your favorite summer dolman into one that’s perfect for cooler temperatures! 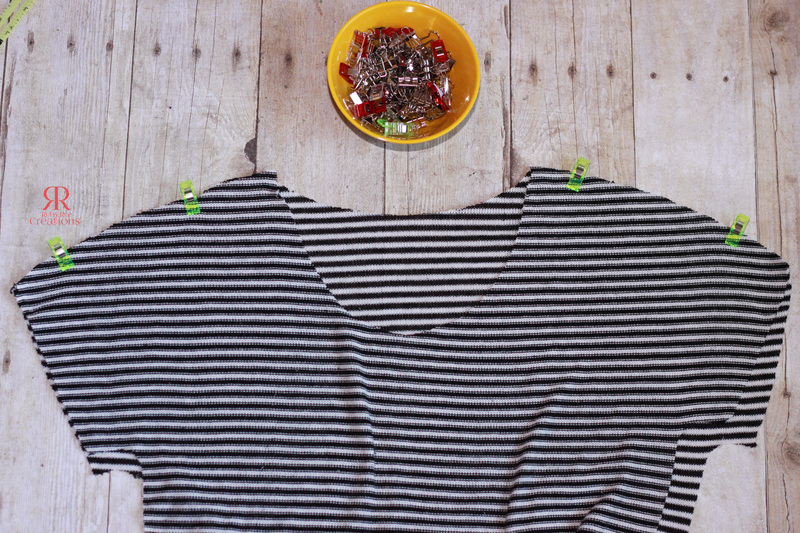 Start by cutting out the front, back and neck band from your Sun Kissed Tee pattern. Next grab your Santa Fe tee sleeve pattern piece. 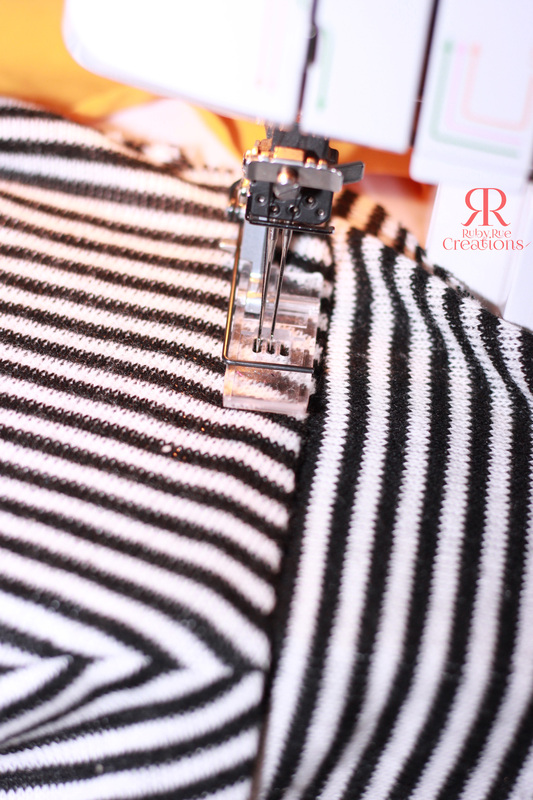 You’ll notice that this sleeve is good for long and short sleeves, which makes it perfect for this project! 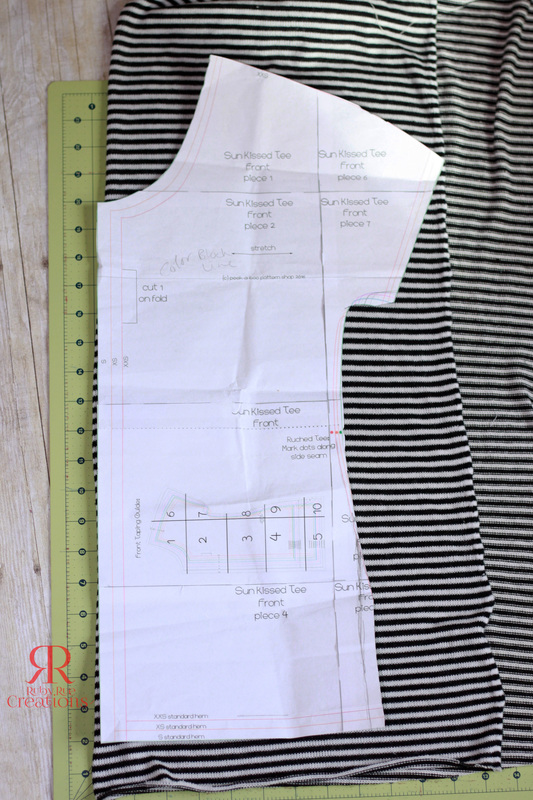 Fold your pattern piece along the “Short Sleeve” cut line. We will be using the bottom portion of this piece. So from that Short Sleeve line down to the bottom of the pattern piece is what you will use to cut your faux long sleeve. Cut 2 of those sleeve portions. As following the Sun Kissed pattern, we will sew the front and back RST at the shoulder seams (where I’ve clipped my green Wonder Clips). Next head over to your iron. One helpful notion that I used during this step is Wonder Tape. It is 1/4″ wide and is sticky on both sides. 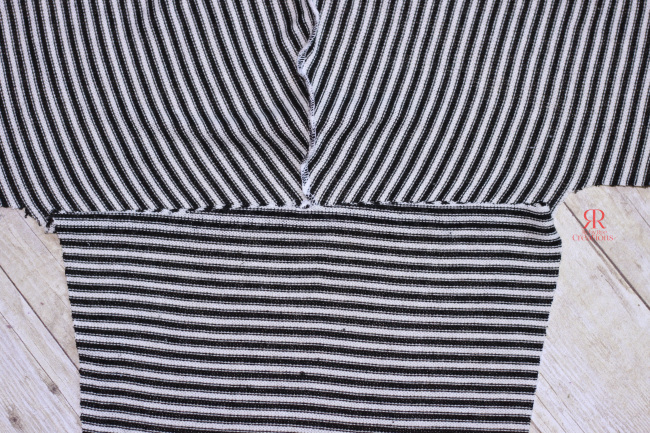 It’s a wash away hem tape, so you can use it to hold hems in place and then it completely dissolves after the first wash. Lay your front/back with the wrong side up. 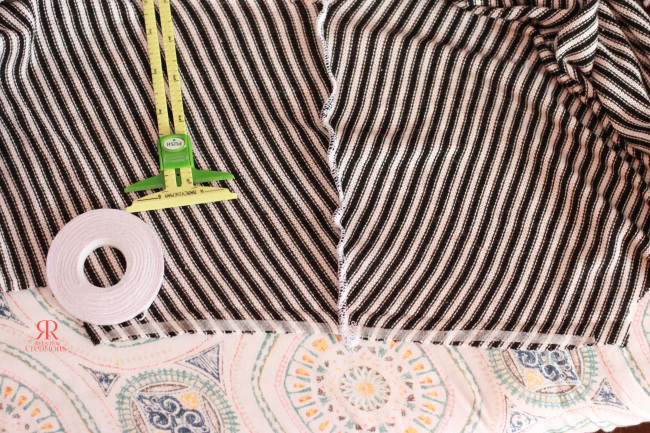 Turn the raw edge of the sleeve to the wrong side of the fabric 1/2″ (I ironed and then used the Wonder Tape to hold it into place). Now take your Santa Fe sleeve. Overlap the upper portion of that piece 1/2″ onto the Sun Kissed tee sleeve. The wrong side of the Sun Kissed tee will be against the Right side of the Santa Fe sleeve. You can see how I did it here. I also used the Wonder Tape to hold the long sleeve onto the short sleeve of the Sun Kissed. You can see what it looks like from the Right Side before I topstitched. Topstitch the faux sleeve onto the Sun Kissed sleeve 3/8″ away from the folded edge of the Sun Kissed. With RST sew the sleeve and side seam together. Hem bottom and sleeves by turning under towards wrong side 3/4″ and topstitching. 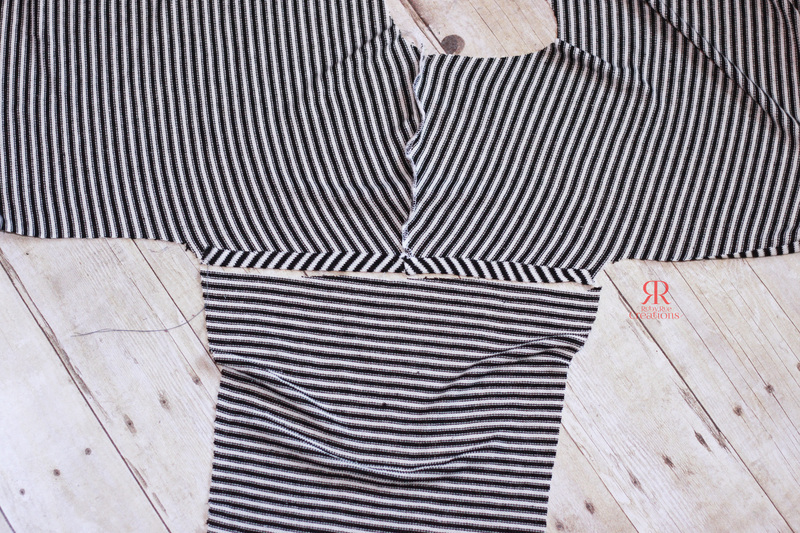 Attach neck binding as indicated in the Sun Kissed pattern. And voila! A shirt for all seasons! For this one I used a thin sweater knit and layered a thin camisole underneath. You can try different knits for different seasons! That’s awesome, thank you! 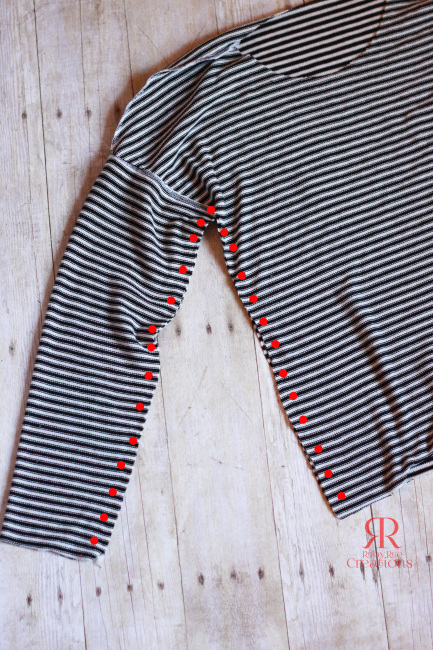 Do you know if it will work with sleeves from any other pattern? I don’t have the Santa Fe pattern yet, but I do have quite a few others that have long sleeves.